Socks in the Frying Pan are a multi-award winning trio from County Clare on the west coast of Ireland, the universal hub of Irish traditional music. Their dynamic vocal harmonies, virtuosic musical ability, and their onstage wit has captured and captivated audiences the world around. One of the most sought after groups in Irish music today, the worldwide 'Sock Invasion' continues! Socks in the Frying Pan comprises of Aodán Coyne on guitar and vocals and the accomplished Hayes brothers, Shane Hayes on accordion and Fiachra Hayes on fiddle & banjo. This youthful trio blend Irish traditional melodies with their own personal flair which has gained them critical acclaim and accolades including 'New Band of the Year' by the Irish Music Association. 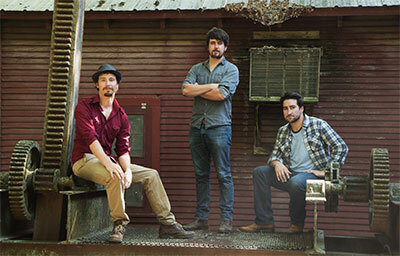 The group have been embraced in the United States, having been booked by every major Irish festival and praised for their modern traditional style and energetic approach to music. They have a clear love for live performance which only compliments the traditional essence in their shows and makes for a truly unique form of entertainment. Do not miss Socks in the Frying Pan at this year's Dayton Celtic Festival!